Fresh as a daisy – well actually, fresh as a tulip! 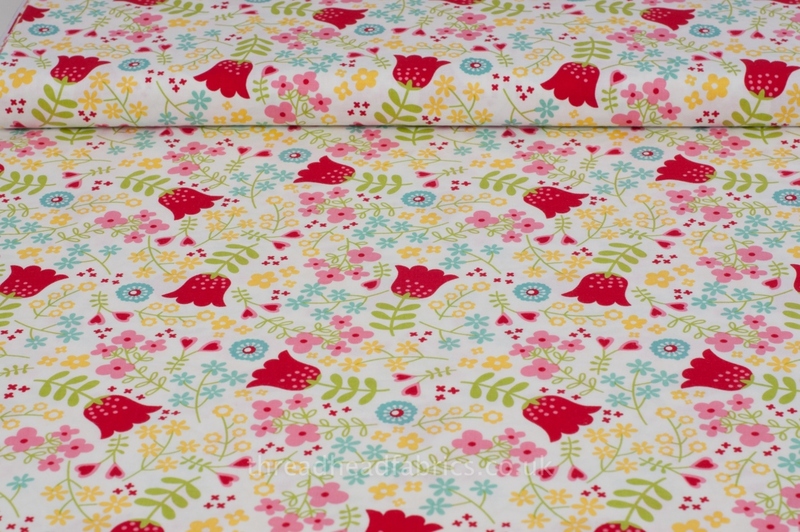 We are so loving this gorgeous floral print! The design is set against a bright and breezy white and features cherry red tulips, sprigs of smaller flowers in pink, yellow and minty aqua with a peppering of tiny read hearts and light green leaves. 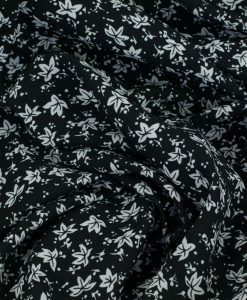 So lovely for children’s dresses or quilts. 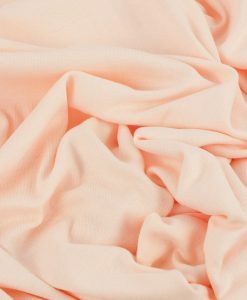 Medium weight cotton fabric can be used for dressmaking, light use home decor projects, quilting, bags and more! 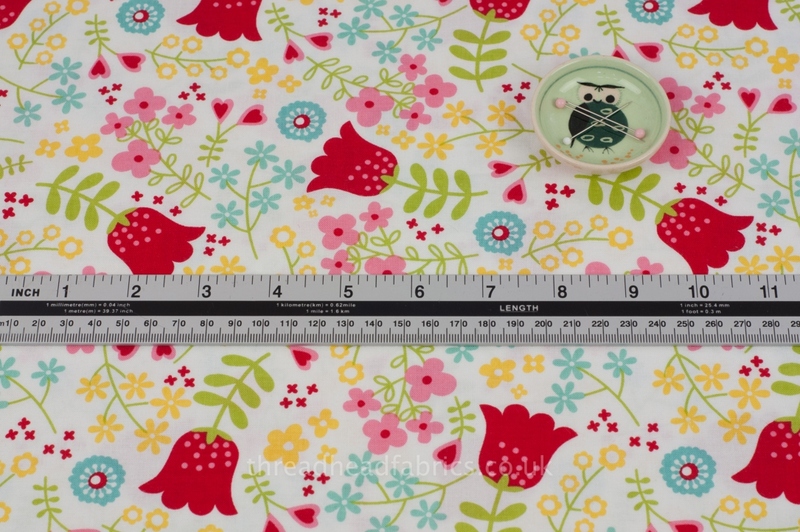 Ready to order but unfamiliar with fat and long quarters? No probs! All you need to know is explained here. Hey fellow Thread Heads! 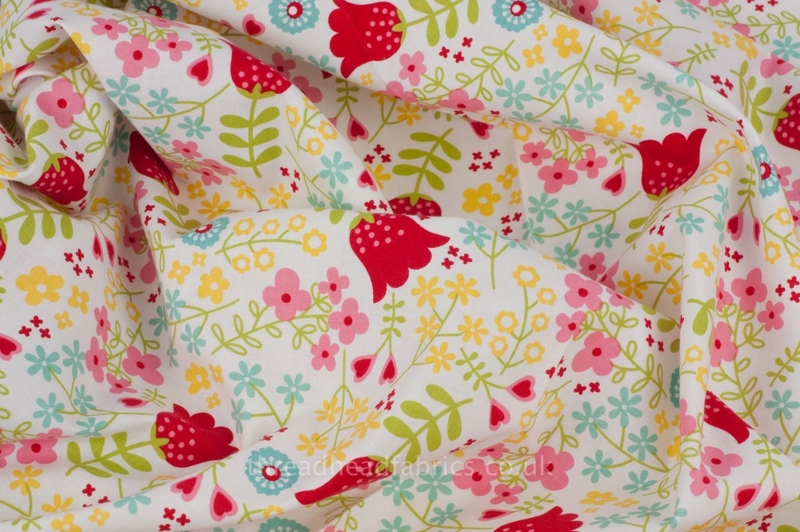 Have a peek at this fresh, lovely print by Lori Whitlock for Riley Blake Designs! 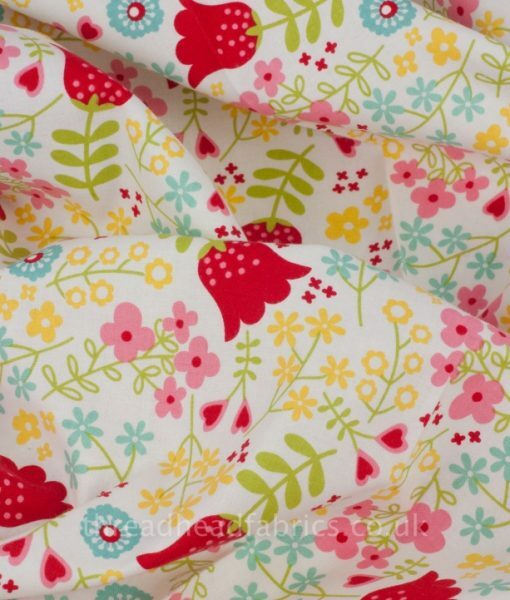 We love this bright cheery print that would look so lovely for children’s clothing, quilts, curtains or cushions. 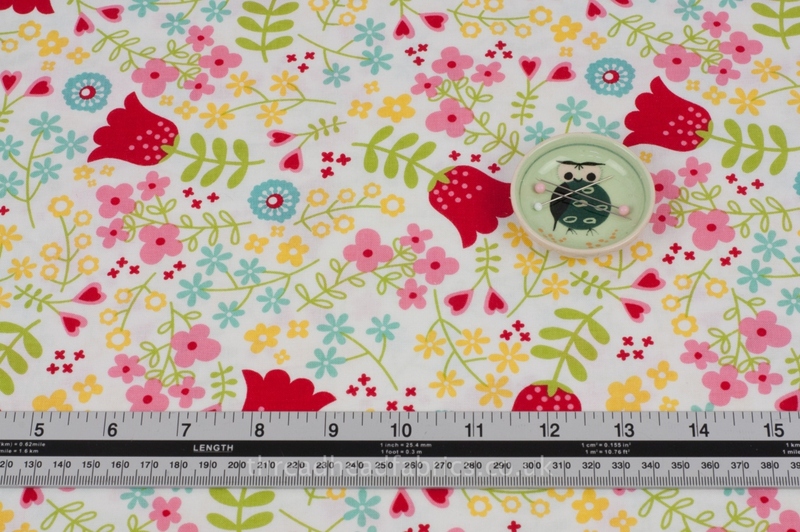 We’re thinking the print is so bright and wholesome that it would work for grown ups, too! I can imagine it as the lining of a tote bag or used as part of a sunshiny modern quilt! Lori is an American blogger and designer who is quite prolific! Her primary design niche is paper craft. 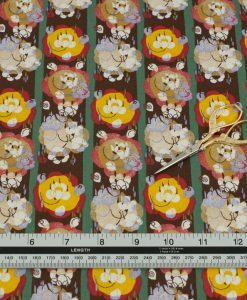 But her bright, lighthearted paper designs translate so well to fabric that it makes perfect sense she turned her talents to textiles..She’s designed more than 10 collections for Riley Blake Designs. And actually there is a new one on the horizon as we write this. She’s one busy woman! 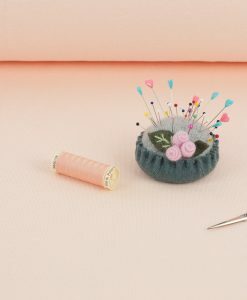 Her blogs feature all sorts of craft ideas. Why not have a nose for some crafty inspirations! 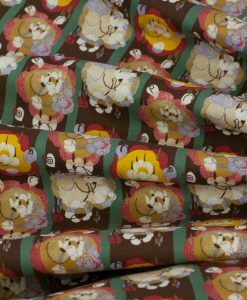 American based Riley Blake Designs is renown for quality fabrics and whimsical, fresh designs that appeal to children and adults. 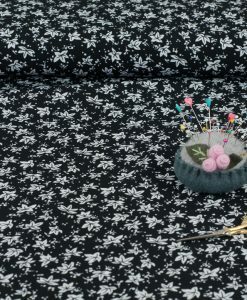 What we find most appealing about Riley Blake fabrics are the quality of the cotton used in their textiles as well as the colour saturation of their prints. This quality makes them a dream to work with! 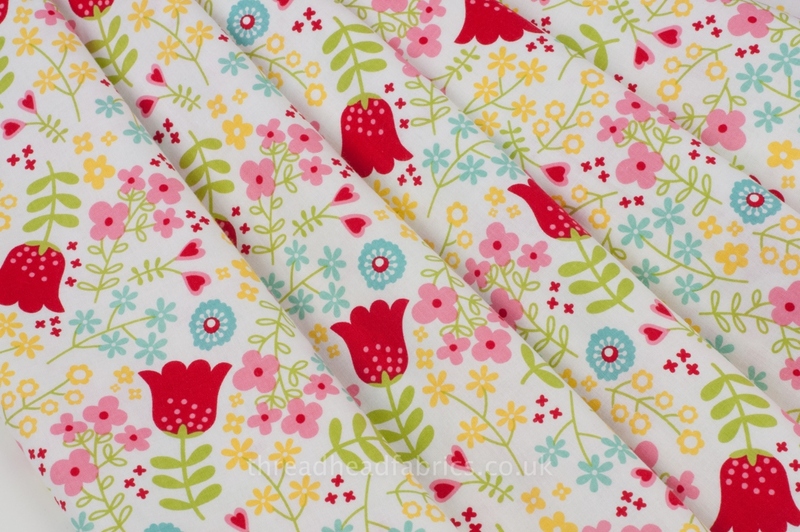 Why not check out the Riley Blake collection of free quilting and sewing patterns. They have absolutely oodles of ideas to get those creative juices flowing! 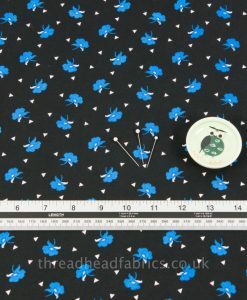 You really will be amazed by the amount of freebie sewing patterns on their website! Manufacturers’ recommended washing instructions: Machine wash separately in cold water. Tumble dry low or line dry. Remove promptly from the dryer. Do not bleach. Do not dry clean. 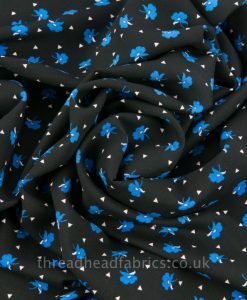 Thread Head Fabrics recommends you pre-wash your fabrics before starting your sewing project as cotton fabric will shrink slightly when washed.